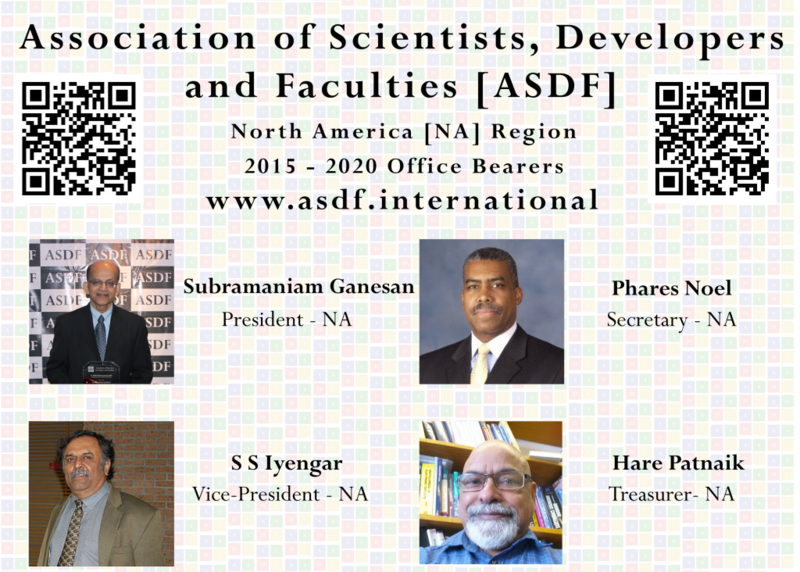 News in NutShell : ASDF Headquarters has now announced the new set of Office Bearers North America Region which will be headed by Subramaniam Ganesan from 2015 to 2020. Officially announced by the ASDF International President and directed by Office of the International Secretary. News in Detail : Association of Scientists, Developers and Faculties incepted in 2010 has now landed in North America (NA) region with full fledge from January 2015. The Governing Council under the leadership of visionary leader Pr. Dr. Anbuoli Parthasarathy has unanimously selected the office bearers of ASDF NA Region which has got resolved in the board with fullest support. The span of the office bearers from 2015 to 2020 of the South East Asia Region will be headed by Pr. Dr. Subramaniam Ganesan who is a senior academician with decades of teaching experiences across the world. This NA Region consists of all the North American countries including Antigua and Barbuda, Bahamas, Barbados, Belize, Canada, Costa Rica, Cuba, Dominica, Dominican Republic, El Salvador, Grenada, Guatemala, Haiti, Honduras, Jamaica, Mexico, Nicaragua, Panama, Saint Kitts and Nevis, Saint Lucia, Saint Vincent and the Grenadines, Trinidad and Tobago, United States (All States) into its domicile. The International Secretary Kokula Krishna Hari Kunasekaran has delegated his powers of signing the Industrial, Research, University and Academic Institutes Memorandum of Understandings to the NA Region Secretary Phares Noel which needs to witness by the NA Region President Pr. Dr. Subramaniam Ganesan. The President of ASDF NA Region for the tenure 2015 to 2020 Pr. Dr. Subramaniam Ganesan is a Professor of Electrical and Computer Engineering, Oakland University, Rochester, MI 48309, USA. He has over 25 years of teaching and research experience in Digital systems. He served as the chair of the CSE department from 1991 to 98. He is with Electrical and Computer Engineering department since 2008. He received his masters and Ph.D. from Indian Institute of Science (IISc) Bangalore, India. He worked at National Aeronautical Laboratory (NAL) India, Ruhr University Germany, Concordia University Canada, and Western Michigan University before joining Oakland University. The Vice-President of ASDF NA Region for the tenure 2015 to 2020 Sundaraja Sitharama Iyengar is a Computer Scientist based on Florida, US. His computational framework has led to a novel range of applications in Sensor Architecture, Oceanographic Image Understanding, and Autonomous Systems. He has laid the scientific foundations for cutting-edge software technologies that provide solutions to fundamental problems in sensor fusion, critical event processing, and autonomous systems and led their deployment to a whole range of commercial and government applications. More Specifically, Computational aspects of sensor networks are a fascinating area of fundamental scientific interest as well as their technological applications. The Secretary of ASDF NA Region for the tenure 2015 to 2020 Dr. Phares A. Noel II is a seasoned engineering executive with decades of both practical and theoretical experience in the field of both systems engineering and automation across various areas ranging from electrical power generation to automotive manufacturing. Having spent the last 20 years of his career in the automotive sector, Dr. Noel has been involved in all aspects of design and installation of manufacturing systems as well as the CAX tools that support them. Currently, Dr. Noel is a member of The Center for Understanding Change (C4UC), a research think tank focused on the application of system dynamic modeling and simulation in the area of risk mitigation for global enterprises and critical infrastructure. He is also a Senior Analyst with CAX marketing research consulting firm Cyon Research of Bethesda, Maryland, an Adjunct Professor in the Department of Computer Science, Engineering & Physics at the University of Michigan – Flint, as well as a member of the Board of Advisors for software firm GrafiCalc of San Jose, California. The Treasurer of ASDF SEA Region for the tenure 2015 to 2020 Hare Patnaik, President of HP Microsystems, US has an almost 3 decades of experience. He has been as key intuitive in projects like Travtek, AHS, collision avoidance, driver simulation. He Consulted with Rockwell / Meritor on Onboard trip recording system, Transmission controller and various data acquisition system with leading automotive products like Ford, TRW, Federal Mogul, Siemens, Delphi Automotive and GD Automotive. The new council has decided to concentrate on University and Government partnerships in establishing Joint Research Activities across the region. ASDF NA would like to give a thrust to research activities across the region by taking up various research studies in all the areas. ASDF NA will also undertake activities to encourage research and innovation within the industry and well as in academia / University. While initiation of ASDF NA Leadership Series will facilitate exclusive interaction between the members of ASDF and industry leaders, at State / National / International level and in turn, provide a platform for exchange of experience and technical know-how, various events will enable the members to get acquainted with the future directions, trends, opportunities and learning across key sectors through lectures by some national & international industry stalwarts. Apart from that a series of learning and development events will also be organized for the senior leadership team of ASDF HQ & NA members such as CFOs / Finance Heads, CMOs / Marketing Heads, HR Heads, CIOs / CTOs / Technology Heads and other key functional heads of the organization. In the mid of 2016 new events are also about to be rolled out which will happen annually at North America region. One such is the event on Cloud on Things and Wearable Technology. This kind of events will discuss the most relevant topics of the uptrends. The International Collaboration will enable the member organizations / bodies to participate in international delegations, both inward and outward, as well as meet people both – nationally and internationally. Schedule for all of these events will be finalized in due course.